Offering you a complete choice of products which include proton tray dyer, proton mass mixer and proton coating machine. Design is cGMP- Curren] Good Manufacluring Practices compliance. All contact parts AISI 316 non contact parts AISI 304. Uniform Mixing with peddle blade Stirrer. The interlocked acrylic covers of product container. enclosed drive & Overloads relay protection. Uniform design. controlled temperature. sturdy construction & large working space. All Contact parts are SS 316/316L.and non-contact parts are S.S 304. Flame proof design and motor with FLP Control Ponel (optional). Steam Radiater/Steam accessories available on demand. In compliance with cGMP. We manufacture tablet Proton Coating Machine basing on the GMP standards. 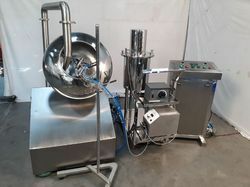 Tablet coating machine is especially designed for film coating of oral solid dosage forms at controlled atmosphere in pharmaceutical industries ensuring user friendly operation. Benefits of our tablet coating equipment include effective mixing of final product bed, lowering emission of organic solvents, long term performance, automatic emptying and many more. 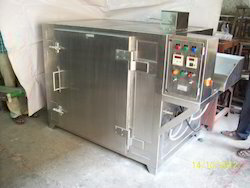 Machine available with flame proof and double / triple deck options.